Jaques Derrida was a philosopher who thought a lot about words. In English we have the word “chair.” We use it to represent an object that exists, that you can touch. We also use the word for our idea about the object: what it is supposed to be, how you are supposed to use it. The word, object, and idea, are not the same thing. Especially when we learn a new language. We have to learn a new word to represent the thing and the idea. But people do not just have different words for things, they also have different ideas about what the things are and how they should be used. Think out something like the word “friend.” What does it mean to say somebody is your friend? Do we all agree about what a friend is? Or the words “like” and “love.” What does someone mean when they say “I like you” or “I love you”? I have spent a lot of hours lying awake at night trying to understand that? Have you? Love is really complicated. Let’s look at a simpler word. 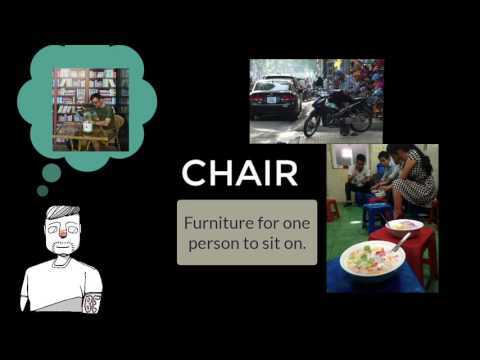 I asked you to think about “chair.” A chair is for sitting, but there are lots of things people sit on. When does something stop being a chair and become something else? 1 Look at the pictures. 2 Check the box if the picture shows a chair. 3 Write under each picture. 4 Explain why you think it is or is not a chair. This activity helps us explore what words really mean, in the dictionary and in our minds. People sit lots of places, but not all of those places are chairs. Or are they?